The RM5 billion i-City project in Shah Alam, Selangor, is 20 per cent completed. I-BERHAD is speeding up the developments of its RM5 billion i-City project in Shah Alam, Selangor. Executive chairman Tan Sri Lim Kim Hong said the company had also been approached by several parties to replicate the i-City project in other cities. "We will consider replicating i-City when the project is about 50 per cent completed. We expect to reach that in three to four years," Lim said after a dialogue session at Balai Berita, here, yesterday. The 42ha i-City is a knowledge and tourism project with 18 office towers and residences, three hotels, a one million sq ft mall, a cybercentre, shop offices and retail units. It will also have several leisure components like a snow walk, a theme park and a waterpark. The project is 20 per cent completed. 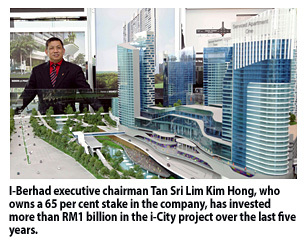 Lim, who owns a 65 per cent stake in I-Berhad, has invested more than RM1 billion in the i-City project over the last five years. In the next six months, I-Berhad will start building Soho (small-office-home-office) and Sovo (small-office-versatile-office) units, the mall and a three-star hotel. There will be a total of 950 Soho and 220 Sovo units, with combined gross development value (GDV) of close to RM600 million. For the mall and hotel, Lim said I-Berhad was expected to ink a deal within the next two to three months with international operators to jointly build and manage the properties. I-Berhad aims to launch RM500 million worth of properties a year at i-City. This will give it a steady revenue of about RM500 million per annum from 2014. Lim said he also expected the leisure division to hold strong, raking in RM50 million in revenue next year and up to 40 per cent in profit margin. For the financial year ended December 31 2011, I-Berhad registered a pre-tax profit of RM1.84 million on revenues of RM27.3 million. “Our mandate is to invest in the local market,” Managing director and chief executive officer Datuk Kamalul Arifin Othman(pic) told StarBiz in an interview. PETALING JAYA: Pelaburan Hartanah Bhd (PHB), a subsidiary and operating arm of Yayasan Amanah Hartanah Bumiputera, will focus on three core areas property acquisition, property development and being a master developer. 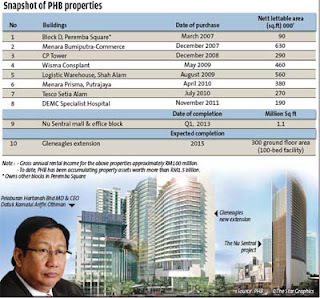 Managing director and chief executive officer Datuk Kamalul Arifin Othman said PHB would be more active in the local property scene as it sought to buy real estates in other state capitals. “Our mandate is to invest in the local market,” he told StarBiz in an interview. Kamalul said that on the local front, PHB would like to have a presence in all the state capitals, including Sabah and Sarawak. He said PHB wanted to focus on these three areas because it aimed to increase the size of its Amanah Hartanah Bumiputera (AHB) fund. Kamalul said the fund was launched in 2010 with a size of RM1bil which was sold in three months. “We want to increase the fund size this year, depending on the properties we are going to inject into AHB,” he said. AHB is the first syariah-compliant fund backed by real estates. 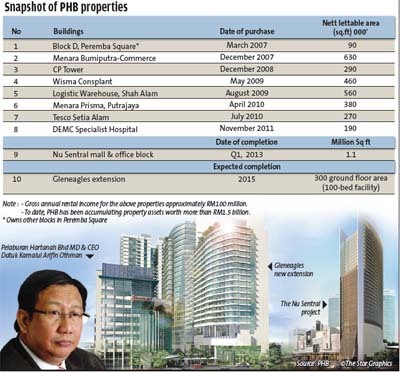 Unlike normal unit trust, PHB will buy the asset first and then only raise money. “We buy the properties and transfer the beneficial ownership to the fund in the sense that every month, the fund is secured with rental guarantee,” he said. PHB currently has several prominent and strategically located properties in the Klang Valley. The value of its total property assets to-date stands at RM1.5bil, generating a gross annual rental income of about RM100mil. This works out to an annual yield of 6.67%, with 160 tenants over nine projects. Some of the office buildings in its stable include four out of five blocks in Peremba Square, Menara Bumiputra-Commerce which is next to Sogo departmental store in the city, CP Tower in Section 16 Petaling Jaya, Wisma Consplant in Subang Jaya and Menara Prisma in Putrajaya. It also owns two retail blocks in Peremba Square, DEMC Specialist Hospital that it purchased in November last year and industrial building Logistics Warehouse in Shah Alam, Selangor. “We want to diversify our revenue (in order to be resilient),” he said. Kamalul said besides accummulating property assets for its recurring income, PHB's second core business was property development. Its maiden project is Nu Sentral in KL Sentral. With a gross development value (GDV) of RM1.4bil, it will comprise a seven-storey mall with gross floor area of 1.1 million sq ft and nett lettable area of 650,000sq ft. It will be KL Sentral's first mall. The second component of the development is a 27-storey office building Menara 1 Sentrum at Nu Sentral with estimated gross floor area of 640,000 sq ft and net lettable area of 450,000 sq ft. It will be built according to specifications of LEED Silver green building. LEED is the acronym for Leadership in Energy and Environmental Design (LEED). Both components of its Nu Sentral project the mall and the office block are expected to be completed in the first quarter of 2013 and will have about 2,000 parking bays. In terms of site location and frontage, Kamalul said it would be among the best. A bridge will be constructed to link the mall to the transport interchange. Possible tenants for the mall include Parkson, cineplex operator Golden Screen Cinemas GSC, Wesria Food Sdn Bhd which will operate and manage a food court, a bowling alley and an MPH bookstore. Mydin will be introducing a new brand at the mall. PHB will retain ownership of the entire project. “Rental lease will be competitive with other retail lots in KL Sentral,” Kamalul said. PHB's second property development is the extension of Gleneagles Hospital that is expected to be completed in three years. It has signed an agreement with Gleneagles to build the medical facilities with a GDV of RM150mil and has signed a long lease with the hospital operator. The remainder of its five acres at the Gleneagles extension will be used to build serviced apartments and PHB is already in discussions with several operators. PHB will own the asset but it will be managed and operated by another party. “The patients at Gleneagles Hospital are very high profile. They and their family need a place to stay and rest,” said Kamalul. On PHB's plan of becoming a master developer, Kamalul said this would be done at the former Lever Brothers land in Bangsar which it bought from Perbadanan Aset Keretapi. “We have submitted our masterplan to the City Hall and it is currently being evaluated. We want to be the master developer for that land. Kamalul said the project would be a mixed integrated community development which would include high-end condominium, retail centres and office buidings. “It will be developed in phases. On the demand side, it will be green in terms of getting the credentials. That will keep us busy for the next several years. There may be opportunities for joint ventures with some of the parties involved,” he said. KLCC Properties Holdings Bhd chalked up a higher pre-tax profit of RM184.45 million for the second quarter ended June 30, 2012 compared with RM148.41 million registered in the same period last year. Revenue rose to RM288.61 million, during the period under review, from RM240.3 million recorded previously, it said in a statement. "Revenue from property investment increased 21.5 per cent to RM126 million in the second quarter primarily due to the maiden recognition of rental revenue from Menara 3 Petronas and upward rent revisions in Menara Dayabumi and Menara ExxonMobil. "This segment also benefited from lower finance cost due to the Midciti refinancing undertaken in October last year," it said. However, KLCC Properties said this was partially offset by finance costs incurred on Menara 3 Petronas which was previously capitalised during the construction phase. The company said the results for the remaining year would remain stable due to long-term office tenancies and expected improvement in retail occupancy. "The hotel segment will continue to trade in a competitive environment," it added. Eastern & Oriental Bhd, a Malaysian property developer, fell the most in six years after the Securities Commission said it’s investigating a surge in its shares last week when an online newspaper “rumor” that the regulator may order Sime Darby Bhd to make a general offer. The stock sank as much as 18 per cent in Kuala Lumpur trading to RM1.56, its largest intraday decline since June 6, 2006 and today’s biggest drop in the FTSE Bursa Malaysia Top 100 Index, which gained 0.2 per cent. It pared losses to RM1.60 at 10:41 a.m. local time. E&O jumped 28 per cent on Aug 10, the most since August 2003, after the Malaysian Insider reported that the commission would U-turn and order Sime Darby to make a general offer after acquiring a 30 per cent stake last year. Last October’s decision that this isn’t required remains unchanged and is subject to a judicial review pending in court, the regulator said in an e- mailed statement the same day. Palm oil producer Sime Darby agreed to pay RM766 million (US$246 million), or RM2.30 per share, for its E&O stake in August last year to expand its Malaysian real estate business. That was a 59 percent premium to its last closing price at the time and 55 per cent more than E&O’s share price on Aug. 9 before the Insider report. General offers are typically made at the original acquisition price. The commission has begun an examination of trading arising from “the rumor,” its statement said. Investors should wait for E&O’s shares to fall to about RM1.50 before accumulating the stock, said CIMB’s Wong, who kept his trading buy call. This means the stock’s total return is expected to exceed the benchmark FTSE Bursa Malaysia KLCI Index by at least 5 per cent over the next three months. “Longer-term fundamental prospects of the group remain promising as its Penang properties are selling well and the launch of new projects in Kuala Lumpur and Johor in the fourth quarter of 2012 and first quarter of 2013 should excite the market,” he said.